the kitchen has to be one of the first rooms in any house to be sorted, don't you think? stove in there would be very loved i can assure you! i'm sooo waiting if anyone's reading this! can one ever have too much white? or just let me know if i'm making you feel relatively normal here! this has to be good for the soul right? so how are your kitchen shelves shaping up? got any hoarding tips to share...!? Your kitchen has such potential, it's already lovely but I can't wait to see how you make it suit you and the touches you add. 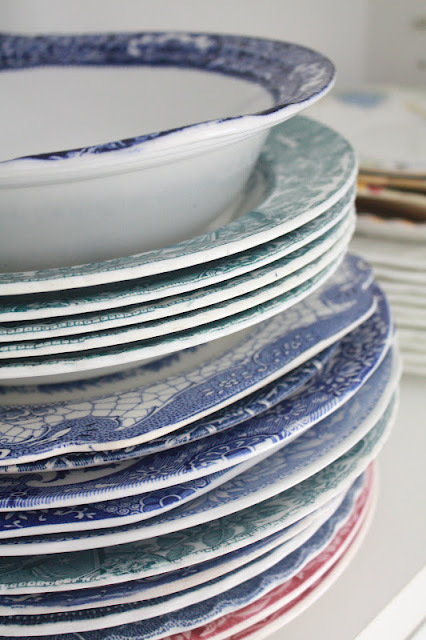 Your china collection makes me swoon - all that blue and white is exactly my type of thing - you have some gorgeous pieces!! The light in your white and bright kitchen is beautiful. 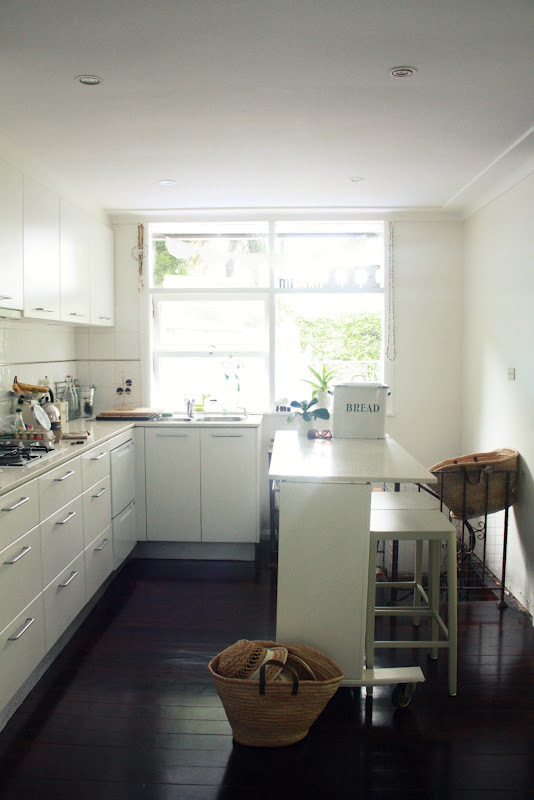 Our galley kitchen got a budget makeover Jan last year and only got finally finished this Jan!! I can't relate to the china addiction. Mine is old bits and pieces (why does all the nice stuff get broken by the kids? I have taken to buying cheap white sets, or stripey bowls and mugs from Kmart now!) but none of it vintage. 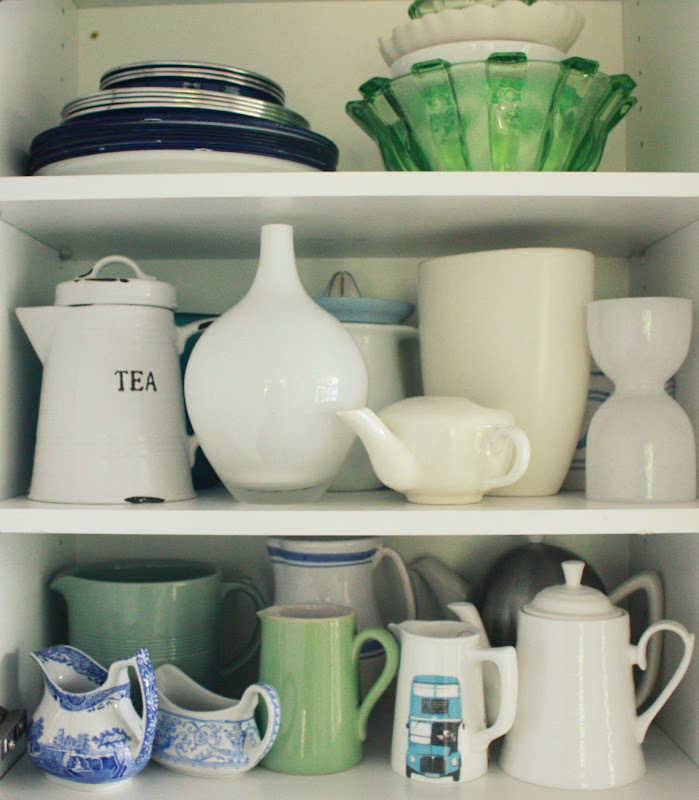 I too love all the blue and white I spy and that gorgeous blue/green jug. Seriously it is impossible to get anything old/vintage for a great price these days. Thanks for sharing, you have a beautiful collection of bits and pieces. I am almost done with my kitchen redo and it has lots of lovely china and iron stone in it.!!! I need another shelf or two or three to house all my lovelies!!!! Your vintage china collection of whites and blues are dreamy. I would love to have such a collection. Didn't think I could love you any more or be more of a fan, but apparently it is possible!!! 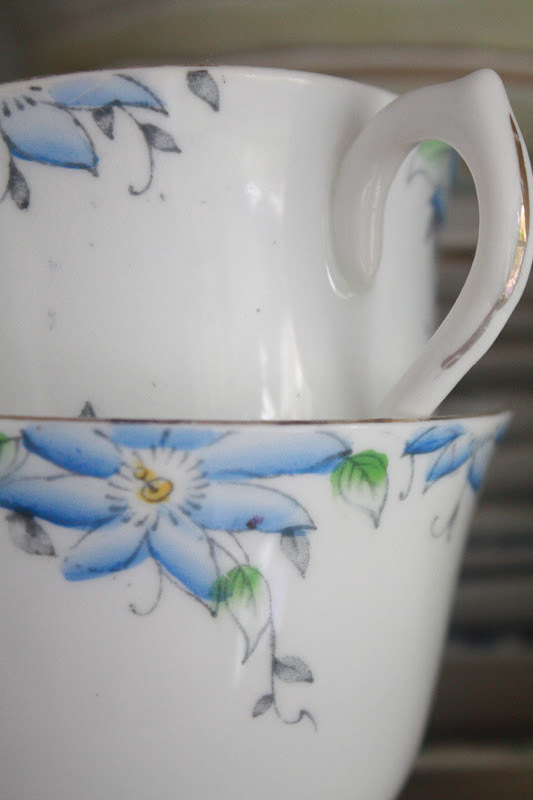 LOVE LOVE LOVE vintage china, your collection is FABULOUS!!! I love the mix and match of old plates....I have been known to have coffee in a cafe simply because they offer coffee served in old mix and match china cups, I love it!!! i have a little bit of a hoarding issue with glass jars (especially vintage mason jars) and vases. I save jars from everything (applesauce, jams, sauces etc). It drives my husband crazy, but I love all the different shapes and sizes and I always keep fresh flowers in the house so I really do get my use out of them! Still the husband thinks it's insane that I keep a whole armoire full of old glass jars! 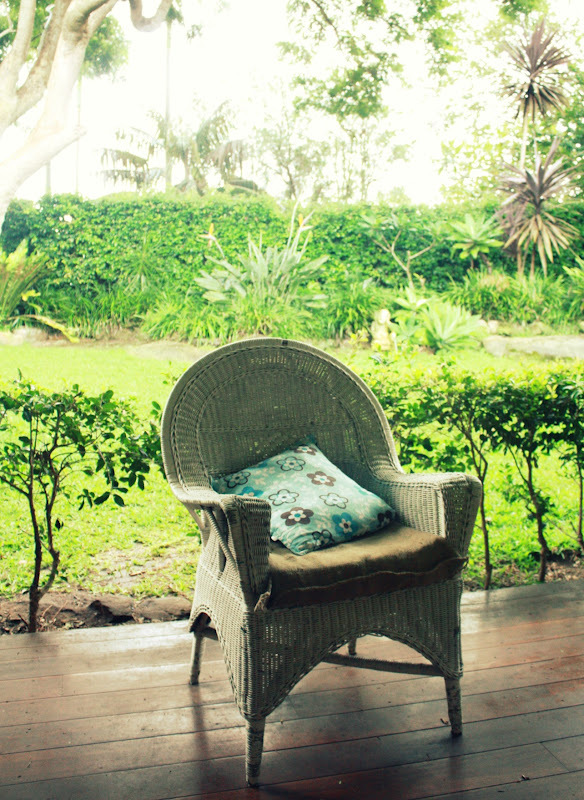 Hi, I have Just popped on over from instagram,, love all your photo's over there and just love,love,,loving your blog. I to am a (scrolling up to see what you called it),,*chinaholic*, roses are my weakness, nothing better than sipping tea from an old english china tea cup,, in fact I am doing just that, while I peruse your beautiful blog. Thank you for sharing, am now your newest follower. oh this is really lovely! 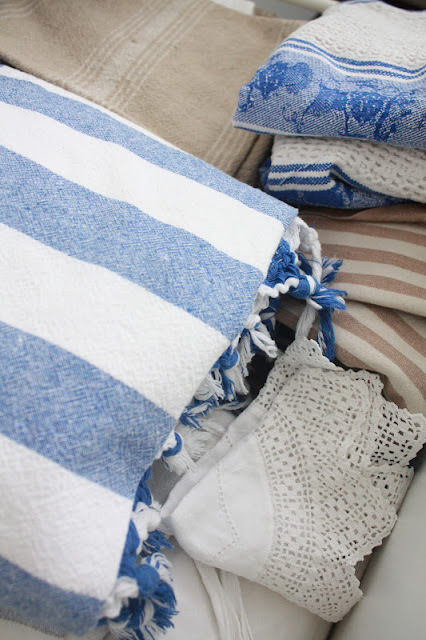 I love the blue and white table linen.. it's a good job you've got all those drawers in that great kitchen. Is the car in good condition. With professional and courteous drivers with a promptness and flair that cannot be beat, why not spend a few extra bucks for a whole lot of peace of mind.